This is not the first time MediaLounge has popped up. Freer, who studied film at NYU and currently creates large-scale experiential work with her company Imaginary Media and designs multimedia work for theater, conceived the idea in 2009. Fresh out of college, she began volunteering her time to help out with technical aspects of performances at Bushwick performance-art loft venue Grace Exhibition Space. The owners offered her the space to use, and Freer decided to engage the work of the interactive artists she had gotten to know. Thus, the first MediaLounge was born. She went on to do the show monthly, showing about ten installation pieces and three performance pieces, but it has never taken place inside a formal gallery space until now. “It had always been my goal to do more of an extended gallery show, because the work that these artists are doing is really high-class, creative, beautiful fine art, and really pushing a lot of boundaries with technology and art coming together,” Freer says. Though the field of new-media art is growing, it is still relatively niche. MediaLounge has served not only as a platform for creative technologists to show work, but also as an opportunity for these new media artists to meet each other. Freer got to know several of the artists with work on display at Westbeth at initial MediaLounges, but her network has since expanded and she is now also showing work by artists from Spain, Guatemala, Denmark, India, and across the US. “It’s rare that you get to be in the same space as so many people that are doing stuff like this. So it’s fantastic for the artists to be in communication with each other, because there’s a lot of sharing that goes on,” she says. Much of the work in MediaLounge spawns out of what Freer calls “creative misuse” of technology, which is a term she and her husband, fellow MediaLounge artist Dave Tennent, came across in a Time Out NY article in 2009. Essentially, these artists are taking pieces of tech designed to be used for a certain thing and instead utilizing its capabilities in unexpected ways to create their own work. 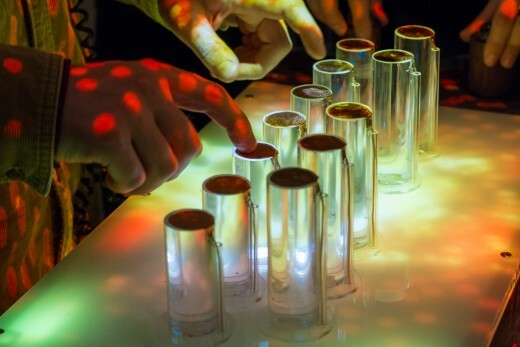 The Microsoft Kinect, Arduino controllers, virtual reality headsets, and online music libraries are just a sampling of what the MediaLounge artists are taking into their own hands. Art displayed in galleries is often very stationery, designed to be looked at and gestured to, but never interacted with. Many pieces shown at MediaLounge instead demand to be touched, felt, or experienced. 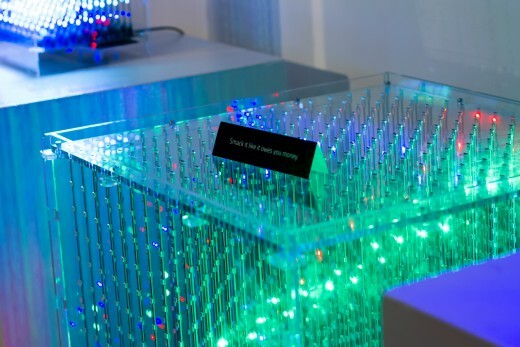 Looking Glass Factory is showing a history of volumetric displays they’ve built over the years, including the L3D Cube, a cube filled with bright LED lights that reacts to touch. A card placed on a massive cube demands you “smack it like it owes you money.” The visuals created by such a smack are dazzling and would be right at home at any rave. 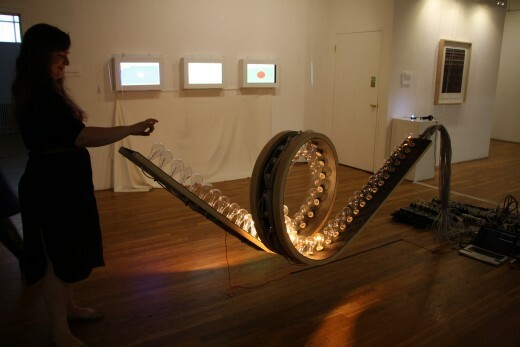 On a similar but different note, EspadaySantaCruz Studio’s light sculpture, Light Kinetics In The Loop, resembles a roller coaster made of lightbulbs. Clinking the bulbs together sets off a stream of light that travels back and forth depending on how hard the force that initializes it was. It’s aesthetically appealing enough to just look at, but being given the power to light up such a structure creates a feeling of delightful agency. The laptop and 14 dimmer racks powering the piece are also in full view, which in a way demystifies the technological process behind the work, but it’s a process that is only clear to those that speak its language. Other pieces are designed for an individual experience. Sultan Barodawala’s film The Memory of Aden Walker follows a man who becomes caught up in memories of his deceased wife. Made using 360-degree video and binaural audio, it is viewed on a version of virtual reality head-mounted device Google Cardboard and headphones, and only one person can watch at a time. The result is a POV-style experience where the viewer is experiencing the memories of a man through his eyes and ears. Stephanie Beattie and Michael Glen’s The High Focus Institute (which had an endlessly long line during the exhibit’s opening) is a futuristic piece that takes place in an elevator and immerses you into a environment of interactive projections, effectively creating another world. The interactive and tangible nature of these works makes them more accessible and engaging, removing the often snobbish mentality of fine art and making it into something experienced directly rather than through artist statements and placards. 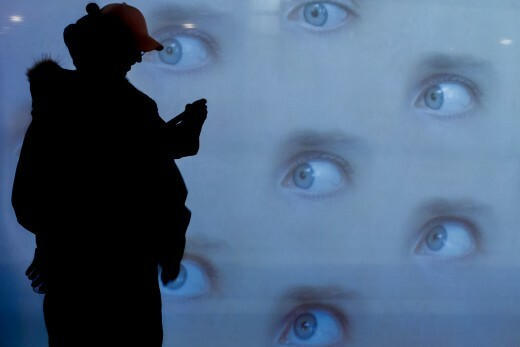 LuxLoop’s video installation, If The Walls Had Eyes, appears initially to just be something interesting to look at. Spanning an entire wall, it features several large eyes, moving and blinking in real time. However, this is not just a typical video piece. It was created with the Microsoft Kinect, a device that was initially designed for Xbox games but is now the go-to piece of tech for creating responsive digital art. Freer calls it “a game-changer for the hacker artist community.” Utilizing the Kinect’s interactive technology, the eyes in If The Walls Had Eyes track and follow whoever is walking by. Ivaylo Getov, one half of LuxLoop, says he doesn’t want the novelty of the technology aspect to overtake the fact that this piece (and pieces like it) is art. “A lot of tech art gets relegated in a sub-category a lot because it uses technology. Even though photography [also] uses technology. I think the approach of finding an image or finding a message or finding an idea and then finding from that what your tech and limitation is what these pieces are doing. That’s what takes it from tech art into art that happens to be using technology,” he says. MediaLounge ultimately seeks to increase visibility of new media art in the fine art world and showcase artists who are making this work, but also hopes to “inspire the next generation of makers.” Accordingly, it does not solely consist of a gallery show, and has been offering workshops and panel discussions frequently, including a lesson on robotics designed for kids and a workshop on the latest edition of media presentation software Isadora, led by its creator. They will be having their closing party on November 29. 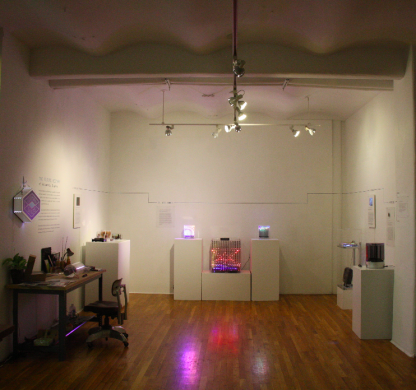 MediaLounge is on view until November 29 at WestBeth Gallery, 55 Bethune Street, West Village. Gallery hours are 1-6pm, Tuesday through Sunday.